The most widely used type of loudspeaker driver is the so called "dynamic" speaker (moving coil-permanent magnet electroacoustic transducer): The electrical current flows through a coil in a static magnet field and produces a Lorentz force, which then moves the elastically suspended membrane which in turn generates acoustic waves in air. Such dynamic loudspeakers are also typically used in mobile phones. Due to the necessarily very small product dimensions they are then commonly called miniature loudspeakers or "microspeakers" and are produced by a couple of manufacturers in high volumes, often on fully or semi-automated production lines. The product dimensions range from a couple of millimeters to a few centimetres and the product shape is mostly rectangular nowadays (e.g. 11x15x3.5 mm). For customer specific product development usually the outer product dimensions and only a few electroacoustic parameters are specified to the development engineer as targets (e.g. nominal impedance, sensitivity, maximum sound pressure or maximum electrical input power). 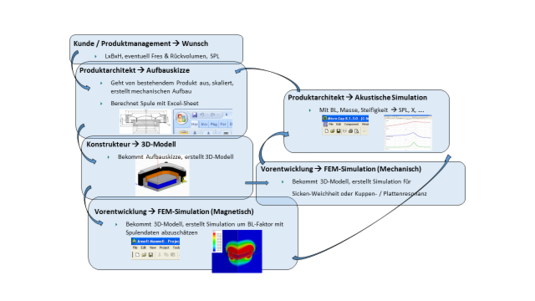 The development process for a product is iterative, with a number of simulations taking place in each development step using different software packages, because the relationship between product dimensions and electroacoustic parameters is nonlinear. In most cases an experienced development engineer will start with an "educated guess" based on the parameters of well-known product samples and will then, step by step and sample by sample, approach a more or less optimal solution. Special attention is paid to exploit methods for increasing overall simulation speed and to designing the whole codebase as well as the software interfaces to be robust and easily extendible for future uses. This thesis is supervised by Gerhard Graber.